Termites are able to spread mold! Your first question might be, what do termites have to do with mold? Well, mold grows in dark environments, where various types of termites like to live in. When termites bite, chew or crawl through wood, mold is dispersed. After this, it can travel and be in the air, making this become easily inhaled by anyone passing through and it can also land on your skin. Remember, there are different kinds of mold, some species more dangerous than others, that could cause serious illnesses. If you ever get any kind of bad symptoms, you should seek termite treatment as soon as possible. Don’t hesitate to reach us if you have any questions about termite control in San Tan Valley. Mold can cause different kinds of illnesses, watch out! To start naming a few bad things you can get, we can start by mentioning allergies, skin diseases, fungal infections, and even toxicity. People that suffer from allergies can get worse on their condition. In other cases, mild asthma can rapidly transform into a chronic condition with more severe symptoms. Different types of skin diseases and fungal infections can also be triggered by mold presence. As we mentioned toxicity, this refers to the effects of the toxic compounds released by the molds. If you expose yourself in extreme quantities, this can lead to neurological problems, and in some cases death. Once inhaled, mold can grow in your lungs, causing a disease known as Aspergilloma. Besides all this, dermatitis, eye infection, itching, and even memory loss are a few of the amount of conditions that can be related to mold exposure. 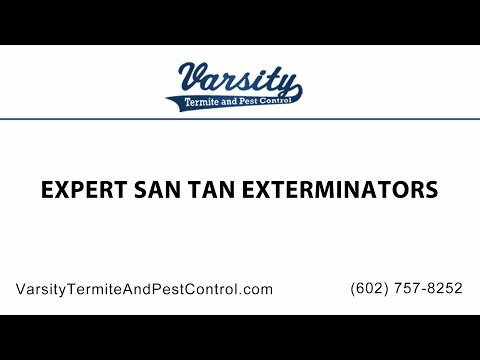 Varsity Termite and Pest Control is always ready to assist you in the termite treatment in San Tan Valley you need. Termites can actually cause damage to structural integrity! One of the most obvious issues for homes affected with termites involved is their structural integrity. Buildings or houses that are made of wood can be unfit to live in if termites have already caused considerable damage to its foundations, beams and other supports of the structure. These little creatures feed on the cellulose in the wood so they will seek any structure made out of this material. This is considered a serious safety issue as once a solid wood structure turns weak and brittle. As soon as the termites have gone through all the wood of a structure and can’t find anymore, they will start to look for paper, drywall or even books. Also, termites damage your electrical wire too! Some type of termites, specially the damp-wood ones, have strong jaws. They use their powerful jaws to bite and chew the electrical wiring or cables they can find, in search for more digestible cellulose, and it can be one of the causes of a short circuit in your home. Short circuits can start a dangerous fire or other electrical accidents, so if you ever find a chewed cable, don’t hesitate to reach us to give you a free termite inspection to your home and evaluate what type of pest control in San Tan Valley you need. To close this blog post, we strongly advise you to hire an expert whenever a pesticide is going to be applied to your home. Some homeowners may want to do the job themselves but they can underestimate how isolated the chemical application of the pesticide is applied on the site, compared to the rest of the house, not eliminating all the termites inside. There are also cases when they won’t wait the time needed for the chemicals to dissipate before they re-enter their home, making them sick or ill in the process. You can contact us at any time, Varsity Termite and Pest Control will assure you that appropriate chemicals are used and applied in the best way to eradicate the pest residing your home.